The Rubio-Schumer Amnesty Bill is a thousand pages of pure, unvarnished treason. And a treacherous "Republican" named Bob Corker just made things infinitely worse in a purported attempt to secure the border to assuage conservatives' concerns. 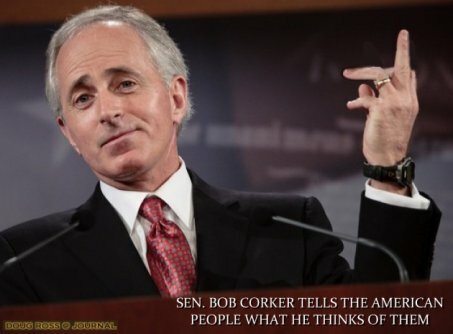 Just as public anxiety about the weak border security provisions in the Senate immigration bill was building, GOP Sen. Bob Corker stepped forward with an amendment to "fix" the problem... Breitbart News has learned exclusively that one provision of Corker's amendment will allow workers who stay in the country past their visa will remain on the "path to citizenship." Even in the future, breaking the law won't stop progress on what VP Joe Biden calls the "unfettered path" to citizenship. The Corker Amendment ostensibly addresses measures to beef up border security. It, however, is also likely to be the last amendment considered on the immigration bill. As such, it has become a 1,000+ page amendment to supplant the current proposal and provide multiple new provisions. It has become the vehicle for ObamaCare 2.0. ...The Corker Amendment wipes away that enforcement mechanism... any worker in the country on a legal work visa for 10 years can get a green card, even if they overstay their visa. The Corker Amendment allows immigrants to break the law in the future and still be eligible for citizenship. It absolves prospective behavior, not simply past mistakes. Prior to the Corker Amendment, the 4.5 million immigrants outside the country on a visa waiting-list were subject to laws restricting their presence in the US. The Gang Senate bill would offer them immediate green cards, as long as they hadn't violated current US Law. The language in the new Corker Amendment referenced above, however, would remove this restriction. They would become immediately eligible for a green card, even if they lived illegally in this country. The Corker Amendment wipes away any immigration enforcement. It is designed to maximize the number of individuals who qualify for citizenship... The Corker Amendment actually stipulates that, in perpetuity, you can break the law, overstay your visa, and still be eligible for citizenship. Far from adding border security to this pathetic bill, the Corker Amendment actually makes things worse. Please call your Senator and two other Senators now and tell them to kill this bill. No permanent Amnesty. No Rubio-Schumer-Obama madness. This bill must be obliterated. Obamacare is going to prove to be near fatal. Obamagration will be the death blow. Here is another site with the Top 40 reasons why this bill should be opposed. NOTHING added to a 'poison pill' is going to make it 'better'. The GOP is not our ally. In fact, they are allied with the Democrats, being the less left wing of that party. How anyone could give a dime to a GOP hack other than Cruz and the like, is beyond belief. We need to realize this, and either begin a third party movement or take back the GOP. Third parties are scorned as causing Democrat victories, but being the GOP base hates the GOP, and so many people are now disenfranchised with the leftists of the democrat party, a third party is now a very viable thing. FineReport, you have caused me to don my tinfoil hat to speculate on the NSA's eavesdropping on then-Senator Obama back in 2004. Is it remotely possible that those wiretaps were put in place to protect then-Senator Barack Obama? Yes, you have to buy the idea that Reps, possibly including Bush, were complicit (or stupid) but is that such a stretch, given what we have learned in the past several months? Nothing about this man is as it seems. He, and we, are living a lie.